Thermal cameras use a completely different type of image sensor than our Near IR cameras. Our Near IR cameras have CCD or CMOS image sensors. 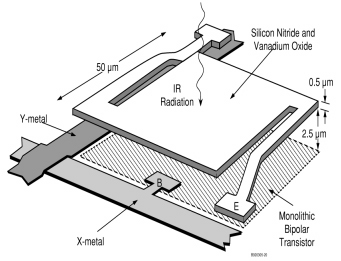 The CCD and CMOS image sensors are inherently IR sensitive. All color digital cameras and camcorder require an internal IR blocking filter (ICF) to block IR light otherwise the colors would be incorrect. 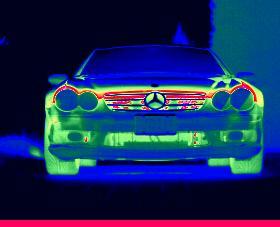 Thermal cameras have a microbolometer image sensor. A microbolometer consists of thousands of tiny sensor elements. Each element has a micro-resistor which changes its resistance as it heats up. The thermal camera focuses heat onto the elements which in turn heat up. 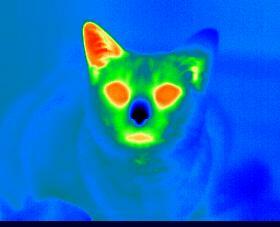 The camera reads the changes in resistance to calculate the thermal image. Because the technology is completely different than Near IR cameras, the two cameras typically do not have any interchangeable parts other than perhaps a memory card. You can't take a Near IR camera and convert it into a thermal camera. What is the size of the thermal sensor? Typically, sensors are either 160 x 120 pixels or 320 x 240. The smaller has 19,200 pixels while the larger has 76,800 pixels. A larger sensor gives you much more resolution but costs more. Does camera display a false color thermal image or black and white? Does the camera has user selectable palettes? Can the user create their own palettes? 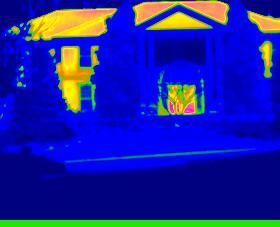 Color palettes are convenient ways for you to see a thermal image. For instance, you may chose to have cold be the color blue, medium yellow and red hot. Or you might want everything black and white with everything over 80 degF red. Or you might want cold to be purple and hot to be yellow. Our cameras have a variety of pre-generated palettes as well as allowing you to create your own and store them on the camera. Can camera save an image to a data card? 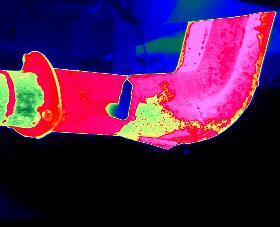 If you can view a thermal image but not save it, the camera may be of limited use. Can you include a voice annotation with image? Including a voice memo can be very useful when analyzing the pictures later. Does camera save a picture image or a temperature measurement array? Some cameras save a simple picture which does not actually contain any measurements. Other cameras store the actual temperature measurements which can be brought into a PC later for analysis. If camera stores a temperature array, does it comes with analytical software? The more sophisticated cameras come with software that allows you to do things like measure temperature points, gradients, differences, bands, averages, assign color palettes and even generate complete Microsoft Word reports with all relevant testing data. How hard is camera to use? This is very important. If camera takes special training to use, you will be spending more time and money for every new user. Some cameras require complex adjustments before operation. Some cameras require periodic software adjustments to account for thermal drift as the camera electronics heat up. Other camera automatically calibrate themselves. Can camera automatically adjust to the thermal range of interest? Some cameras require you to manually set the high and low temperature points in order to set the false color display. It is important to set as small a range as possible in order that you can see the widest range of information. For example, if you need to measure small temperature differences of 1 degree between 60 and 65 degrees, you will set your camera up differently than if you are looking at something with a 50 to 500 degree temperature range. Some cameras will automatically set the range as small as possible based on the highest and lowest temperatures it sees. If you have to set the camera manually, you will likely be often readjusting the camera parameters. Does camera have a built in visual camera? Some cameras include both a thermal image sensor and normal camera sensor allowing you to switch between looking at a thermal image and a normal video image. Does camera have a video output? If camera has a NTSC video output, you can connect camera to a camcorder to record thermal video. How heavy and bulky is camera? We have thermal cameras that are small enough to fit in your pocket to large ones that require their own briefcase. Does camera have a built in laser locater? Some of our cameras have a built in laser pointer that allows you to easily see what the camera is looking at. Can camera be set to sound an audio alarm for a maximum temperature? Our cameras can trigger an audio alarm if camera should see any temperature above a user designated point. These alarms can be useful to screen passengers or crowds for people with a fever that could be carrying a hostile virus such as SARS. If camera can store information, does camera have a built in memory or data card? We have cameras which can store data on common camera memory cards and have up to 8 GB of internal memory. How long can camera operate on batteries? Our smallest camera can operate for over two hours on a matchbox sized battery.